Every year I put in a main crop of ‘Agria’ spuds – they’re by far the best for winter roasts and hot chips – as well as an early crop of ‘Jersey Benne’ or ‘Cliff’s Kidney’ for Christmas Day, but this year my vege patch planning was thrown out of kilter by morning sickness. I put in a bag of ‘Agria’ seed spuds the week I found out I was pregnant in September, but I never quite got around to getting any ‘Cliff’s Kidneys’ in the ground. Not to worry, on Christmas Day we dug up half the ‘Agrias’ and ate them instead. We dug the rest of my spuds early this week, as I need more space at the end of the asparagus bed to plant lettuces (we’re serving gourmet hamburgers at our wedding). 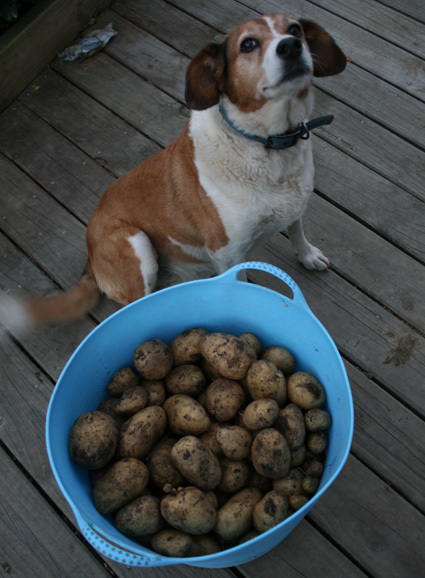 We filled a 40-litre plastic trug with mighty fine tubers, which weighed in at 17.4kg. I’m proud as punch. That means my total yield was probably in the vicinity of 30kg. What a difference decent soil (and three bags of sheep pellets and two bags of blood and bone) makes. Gypsy is my favourite dog today, while Mr Puppy Doo-Hawg (our 11 month old border collie) is in my bad books. He digs holes when he’s bored, and he must have been very bored yesterday because the little sod uprooted half the white garden underneath our lounge window. Just when the impatiens had finally linked limbs and were looking lovely (especially in the moonlight), he destroyed about a dozen of them. And he also dug up (and appears to have actually eaten) one of my ‘Bridal Bouquet’ hydrangeas. We’d just mulched the bed with fresh compost so his blackened dirty paws were a dead giveaway. funny the neighbour hood cats always arrive after i put the potatoes in with blood and bone.. Being a newly converted gardener, the show and blog are keeping me motivated! I’ve had a weird thing with my first ever potato plants – little bunches of what look like baby green tomatoes. Are these potatoes that wish they were under the ground? I’m not sure I’ve got the hang of the mounding up; perhaps I haven’t done this enough? Should I pull them off or weight the stem down and bury them do you think?